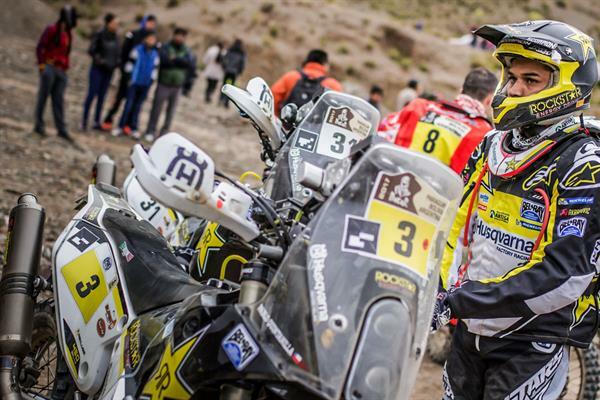 While the Dakar Rally 2017 takes the rest day after a washed out and cancelled sixth stage, Rockstar Energy Husqvarna factory riders Pablo Quintanilla and Pela Renet can take stock of the ride so far and prepare for the second half of the race. Quintanilla, the 2016 FIM Cross Country Rallies World Champion is close behind overall leader Sam Sunderland. He currently trails the leader by 12 minutes but as the 2017 edition of the 9,000 epic in South America has shown, it is impossible to speculate who might take the prize. The Chilean, third in last year’s rally has been delivering consistent results, knowing that with so many factors that can influence the result, that is his best tactic. It seems to be paying off but there are still many kilometres to ride before the chequered flag in Buenos Aires, Argentina, next Saturday. Meanwhile, Quintanilla’s factory teammate Pela Renet of France is at overall eighth place and has already surpassed his result from his maiden ride last year when he went out in the fourth stage. His strong results in stages 3-4 indicate he is a rider to watch in future editions. Renet, like many others lost time on Friday during the fifth stage, which presented particularly difficult navigation and was eventually scrapped at the half way mark of the planned special because of heavy rain. The fact that so many competitors suffered the same fate is reflected in the fact that despite finishing back in the field, he still hung onto his overall eighth place. He has set his personal goal at a top 10 finish. Organizers promised that this edition would be difficult, with new variants in navigation and a string of days at uncomfortable high altitudes. All of that has proved to be correct. The first days after leaving Asuncion in Paraguay were blisteringly hot with temperatures in the high 30 degrees Celsius, while riders rode the liaison from Oruro to La Paz on Saturday in torrential rain and very cold temperatures. When riders leave the Bolivian capital on Monday morning they travel south to Uyuni, where they will bivouac overnight. Because it is the scheduled marathon stage they are denied any contact or assistance from their teams on the overnight stop between Uyuni and Salta in Argentina, their destination for Tuesday’s stage. For first stage of the marathon it will be particularly important to preserve tyres and machinery. After Salta they still have long and challenging timed specials integrated into the stages. The final day is Saturday, where they still have 786 km to ride to the finish line in Buenos Aires, with the traditional short timed special of 64 km. Riders head into the Argentine capital in reverse order.